Please click HERE to fill in a form to receive a link to the full-colour Dunblane Cathedral Magazine, straight to your inbox. Dunblane Cathedral, built upon a Christian site first established by Saint Blane around the year 600, is one of the few surviving medieval churches in Scotland. It is home to a vibrant and welcoming Church of Scotland congregation of around 1,000 members and serves the parish of Dunblane and its surroundings. Within its ancient walls, people of all ages gather to worship and to explore the significance of the life and teaching of Christ. Dunblane Cathedral is part of the Presbyterian Church of Scotland. The main weekly service is held each Sunday at 10.30am, and all are welcome. During this time, Cathedral Kids also meets and shares in the first part of the Service. A Welcome Area is set close to the Main (South) Door where visitors may make themselves known or seek assistance. Tea and Coffee are served in the Cathedral hall after the Service, to which visitors are especially welcome. A transport service to/from the Cathedral is provided for anyone in the local area who may find this helpful. During the summer months, we also hold a short, informal, half hour family service each Sunday starting at 9.15am. All are welcome to join us at this, leaving the rest of the day free to enjoy the summer weather! In addition to the Sunday services, we also have a weekly mid-week service held on Thursdays at 11.00am in the choir area of the Cathedral. All are most welcome at this informal, short service. Additional sevices e.g. Evensong may be taking places are other times during the year. Look in the Events page for dates and times and more details. For special services - baptisms, weddings, etc. - look here for more details. If you plan to visit Dunblane Cathedral at other times than services, look here for more details, including opening hours. Are you able to help us with setting up and helping with our cafe and stalls? Or perhaps you could help us collect the donations given by Dunblane's residents to this worthwhile cause? If so, please click here and fill in the form - we will be in touch. Thank you so much! 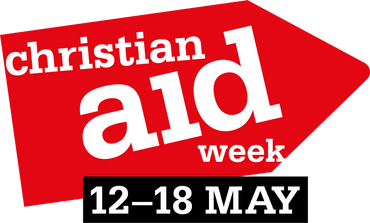 Click on the logo on the left if you wish to know more about Christian Aid. We're looking for volunteers - can you help? If you think you can, please fill in your details HERE and we will get in touch. Thank you. A short mid-week service held in the choir area. All are welcome to join us. Entires for the following magazine to be sent directly to the Magazine Editor.